Conceptually, hand assistance should reduce complication rates, particularly intraoperative complications. More rapid dissection, better hemostasis, and more rapid identification of structures are publicized benefits of hand-assisted laparoscopy. In contrast, potential added risks include incisional complications, namely wound infection or hernias, and inadvertent bowel or adjacent organ injury due to the presence of the intraabdominal hand, which sometimes is not always in view laparoscopically. 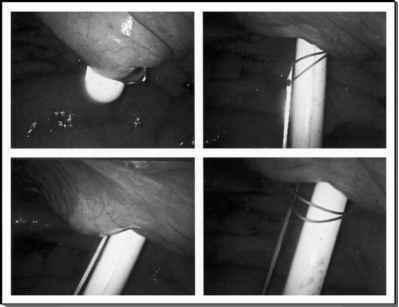 Similarly, concerns of increased abdominal pain, and higher risks of ileus as compared to standard laparoscopy may be part of the postoperative expectations of patients undergoing hand-assisted laparoscopy procedures. The morbidly obese are a controversial subgroup in laparoscopy. Hedican et al. reported that hand-assisted laparoscopy was not only safe but in fact beneficial in the obese subgroup. It is the authors' belief that handassisted laparoscopy is particularly useful in the obese population, because the hand incision may be less significant in this patient subgroup. Moreover, these patients have capacious abdomens, which also favor the use of hand-assisted laparoscopy. aOne case in this series was a simple nephrectomy. bOne case was converted from retroperitoneoscopic to HALS. Abbreviations: HALS, hand-assisted laparoscopy; OR, operating room; RP retroperitoneoscopic; TP, transperitoneal laparoscopic. In the personal series of 424 handassisted laparoscopy nephrectomies by one of the authors (JSW), infections and incisional hernias at the handassisted laparoscopy incision site have occurred in 6.8% and 3.5% of patients, respectively, compared to rates of 0.5% and 0.2% at the laparoscopic ports in the same patients. This increased rate of wound complications is an important consideration for hand-assisted laparoscopy. reported a larger comparison with their analysis of 39 patients undergoing standard laparoscopic nephrectomy and 80 patients undergoing hand-assisted laparoscopy nephrectomy. Importantly, the operations occurred over generally the same time period and there were no differences in preoperative characteristics of the patients and lesions. Differences in these factors have flawed other comparisons of these two techniques (see below). Similar to the findings of the earlier study (5), the hand-assisted approach reduced mean operative time by almost an hour and was associated with a lower complication rate. Hospital charges and length of stay were similar between the two groups. Noteworthily, wound complications tended to be less in the hand-assisted group. Both of these studies suggest that, at least early in a surgeon's experience, hand-assisted laparoscopy "shortens the learning curve" for transperitoneal nephrectomy. With regard to the wound complications, however, the data of Okeke et al. (64), who compared 13 hand-assisted laparoscopy nephrectomies with 16 standard laparoscopic ones, revealed a 23% incidence of major wound complications at the hand-assisted laparoscopy incision site compared to none in the standard group (two severe wound infections requiring readmission, and one incisional hernia). In the personal series of 424 hand-assisted laparoscopy nephrectomies by one of the authors (JSW), infections and incisional hernias at the hand-assisted laparoscopy incision site have occurred in 6.8% and 3.5% of patients, respectively, compared to rates of 0.5% and 0.2% at the laparoscopic ports in the same patients. This increased rate of wound complications is an important consideration for hand-assisted laparoscopy.